A disclaimer of sorts: I have watched at least the first several seasons of every Shonda Rhimes show, but I have given up on all of them. They stress me the hell out. The drama always feels fresh at first, and then it’s like all the shows start to cannibalize themselves, more and more people die, no one ever stays together for good, etc. There’s no stability. That’s a primetime soap for you, and why I don’t watch them anymore, but I’ve always admired her for her engaging, at times batshit, storytelling style, and her ability to get you to care for her characters, even if I can’t watch her shows anymore (seriously, I never got over the airplane crash). Anyway, all this to say I went into this with mixed feelings about her creative output, but positive feelings towards Shonda herself. And the idea behind the book was really intriguing: that she set a goal for herself in 2014 to say “yes” to everything instead of “no,” as she had been doing up until then. 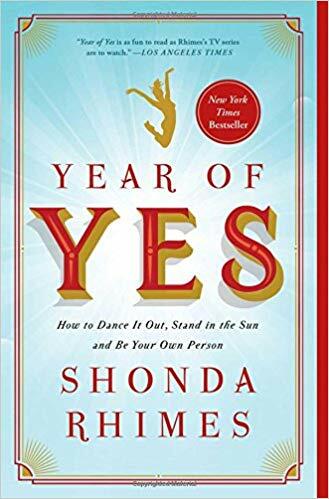 This mission was sparked in her head when her sister Delorse while preparing Thanksgiving dinner in 2013 muttered to herself, “You never yes to anything.” This stuck in Shonda’s head until one day about a month later, she realized she wasn’t actually very happy, despite all her success and her three young daughters. Unsurprisingly, her commitment to this goal legitimately changes her life. She talks extensively about her introvertedness, and how her habit of saying no (or rather, saying yes to comfort and safety) had kept her closed up tight to bad things, but also good. She began doing the things that scared her, learned not only to yes to opportunities, but to her family, to her friends, and how to yes to “No”. That last one is key, because of course you shouldn’t always literally say yes to everything. She learns how to set up healthy boundaries in her life between her work and home life (she’s a workaholic big-time), and her new positive attitude and happiness in her life, along with her new ability to engage in tough conversations she would have previously avoided, actually weeds out toxic people from her life personally and professionally. It was all pretty inspiring, and honestly, anxiety-inducing. I was right there with her as she talked about being the best at getting out of things, saying no, shutting herself up in her imagination pantry (it’s a thing in the book I don’t have time to explain), and “putting food on top of it.” These are things that I am also very good at. Thinking about not doing them made me very, very anxious. I’m going to have to ponder this book. This is definitely worth reading. It feels genuine to me, and not just because Shonda’s voice leaps off the page. (This is something that may get to some readers. Her writing style is extremely conversational, and like her TV writing, is very dramatic and full of repetition. It worked for me, but I can see how it might not work for other people.) The things she is saying are not really revolutionary, but put all together, they are undeniably compelling. Share the post "“Happiness comes from being who you actually are instead of who you think you are supposed to be.”"
Oof. This hits too close to home. I should probably say yes to reading it?